— Guest post by Mike Stiff, Ph.D., and undergraduate student Hannah Aaron. 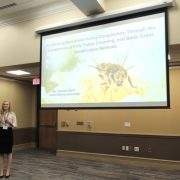 Undergraduate researcher Hannah Aaron is fascinated by honey. Her interest began when her family looked into keeping bees when she was a student at Lenoir-Rhyne University in Hickory, NC. She learned about many uses for the delicious sweetener, including inhibitory effects on bacterial growth and anti-inflammatory effects. She also learned that not all honeys you can purchase are the same. Honey that can be identified as sourced mostly from a single plant species, like sourwood, is more highly coveted by consumers and can fetch a higher price for farmers than other honeys. Hannah also learned that in the US, honey sold in grocery stores is commonly diluted with additives such as corn syrup. This adulteration is usually motivated by economics: diluted honey will go further, yielding a higher profit at the expense of unsuspecting consumers. This process keeps US consumers from reaping all of the natural benefits of eating pure honey. If a consumer is serious enough to purchase high value honey, they should have a method of knowing exactly what they are buying. Hannah wanted to find a fast, reliable method to confirm the plant source of honey. Honey is produced when worker bees collect nectar from flowers in the surrounding area, picking up pollen from every flower visited. The nectar is turned into honey by the bees, but the pollen is also left in the honey. A sample of honey can be multifloral, commonly considered “wildflower honey”, or monofloral, meaning the bees visited mainly a single flower source for nectar. The presence of particular pollen confirms the honey’s authenticity. Lack of pollen is a characteristic sign of diluted honey since corn syrup retains no pollen. A reliable method for authentication would add value to the honey product. The flower species most visited by bees making the honey is typically assigned by comparing the honey sample to a color chart of common honey colors. With this method, there is no way to tell if the honey is free from additives and comparing the honey color to a chart could be a matter of opinion. Alternatively, someone with specialized training could painstakingly identify and count plant pollen in honey samples, a time-consuming process. 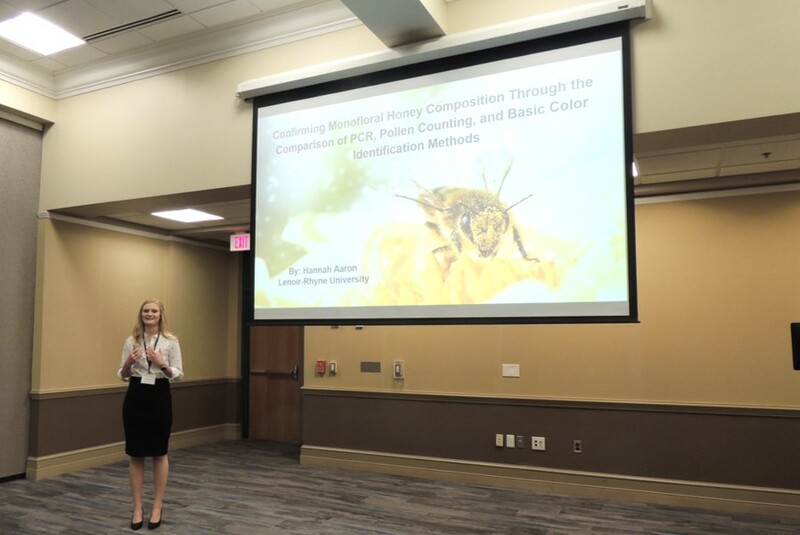 Hannah thought PCR could be a relatively fast, accurate method for identifying floral sources from the pollen in honey. Working with her undergraduate research advisors at LRU, Dr. Michael Stiff and Dr. Leslie Heffron, Hannah developed an honors research project using a DNA barcoding sequence that allows for differentiation of samples down to the species level called ITS2 (Internal Transcribed Spacer 2). The miniPCR™ system was ideal for her project because of its ease-of-use and potential for field use at bee farms on-site. Hannah collected pollen from honey labeled with Sourwood, Acacia, and Tupelo as the respective flower sources. Samples were stained and observed with a light microscope to confirm the presence and identity of pollen of each plant species. PCR reactions were first performed with whole pollen as the template DNA on the miniPCR™ system. The results were analyzed by gel electrophoresis on 1% agarose gel using the blueGel™ system. Using whole pollen from monofloral honey led to a single amplicon of consistent size. However, amplification efficiency was inconsistent from one sample to another, so Hannah thought she could solve this problem by extracting the DNA from the “honey” pollen using a commercial DNA mini-prep kit. DNA was extracted from freshly collected lenten rose pollen, camellia pollen, wood cambium, and purchased bee pollen to use as the template for PCR reactions. In addition, two samples from multifloral wildflower honey without DNA extraction were also tested (“Honey DNA”). Each reaction yielded a single amplicon on the 1% agarose gel, except for the lane containing cambium. It appeared that DNA extraction was needed on a single flower source such as the camellia and lenten rose pollen, but for samples with mixed pollen types some unknown pollen type could yield template as seen in the wildflower honey and mixed bee pollen results. PCR provided a robust method for detecting pollen and identifying floral species by DNA barcoding. In the Spring of 2018, Hannah presented her undergraduate research at the North Carolina Academy of Sciences annual meeting where she won a John Bowley Derieux Research Award for Biotechnology, Molecular Biology, Chemistry and Physics. For future work, Hannah suggests that changes to the electrophoresis or sequencing of the amplicons might allow for easier differentiation between honey samples. While there are other methods for testing honey purity, such as measuring the adulterant-associated C4 isotope present in a sample, most may be cost prohibitive. “PCR analysis with miniPCR™ was accurate in confirming that floral DNA was in the honey. 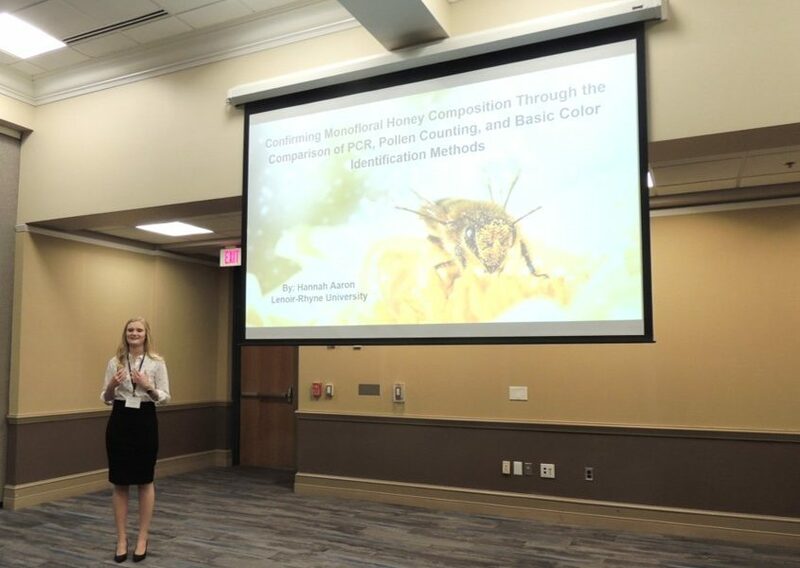 If this PCR method becomes practical for routine use, then consumers will be assured that a given honey is what is claimed by its producers, adding even more value to an already golden resource,” hopes Hannah.